The Supreme Court today grilled the Centre on various aspects of the new reservation law providing 27 per cent quota to OBCs in the institutions of higher learning, especially on the question of the hurry shown in passing it in the absence of any data, while reserving its verdict on a bunch of petitions for a stay on the new Act. Portfolios to Punjab ministers were finally allocated today with Chief Minister Parkash Singh Badal effecting a “generational shift” in the politics of the state. Does the Sensex fall call for any government intervention? Visualising the IAF in 2025 as a force based on scientific and technological competence, President A.P.J. 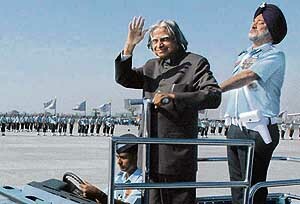 Abdul Kalam said the winners of future wars would be warriors who can foresee the enemy strength on the basis of scientific and technological capabilities and develop suitable strategies for meeting any eventuality. A pal of gloom descended on Rajoke village in Valtoha town of Tarn Taran district, near here, when nine persons, including five members of a family and their friends, died after their jeep collided head-on with a truck near Pandori village. The Congress today decided to take on the sulking former Haryana Chief Minister Bhajan Lal when it suspended his MP son Kuldeep Bishnoi for anti-party activities after his public attack against party president Sonia Gandhi. India and Pakistan today made conceptual progress on fighting terrorism together, but operational progress, if it comes about, is still in the womb of time. “On International Women’s Day, we want to spread this message that heart problem is just not a man’s disease.